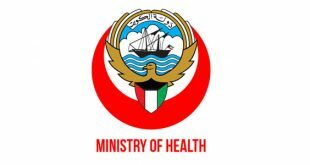 KUWAIT CITY, June 27: According to a recent report issued by Ministry of Health, the number of medical centers located in various parts of Kuwait is 104, and these medical centers registered a total of 21 million visits in the year 2017, reports Aljarida daily. The report explained that 64 percent of the visitors are citizens and the remaining 36 percent are expatriates. Farwaniya Governorate registered the highest number of visits with 24 percent, followed by Capital Governorate with 14 percent. 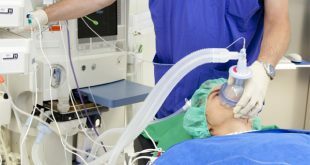 There are 12 private hospitals that provide health services along with the hospitals affiliated to Ministry of Health and three hospitals belonging to the oil sector. The number of beds in the private hospitals is 1,082, the number of doctors 1,045 and the number of nurses 2,884. 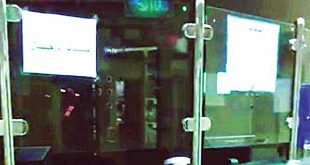 Ibn Sina Hospital came first in terms of the number of visitors to the outpatient clinics with a total of 22,000 visitors. 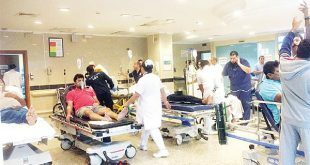 Al-Razi Hospital came first in terms of the number of emergency cases with a total of 148,834 cases. Psychiatric Medicine Hospital has the largest number of beds with a total of 816 beds. In Amiri Hospital, each doctor conducted an average of 272 consultations per year, which is the lowest. On the other hand, in Farwaniya Hospital, each doctor handled an average of 757 patients per year. In the Amiri Hospital, each nurse dealt with an average of 126 patients per year, which is the lowest rate as per the report. The highest rate was recorded in Farwaniya Hospital with each nurse handling 304 patients per year. Palliative Care Center witnessed the lowest rate of outpatients compared to the number of doctors, with 59 outpatients for each doctor per year. It also recorded the lowest rate of outpatients compared to the number of nurses, with 8.6 outpatients for each nurse per year. 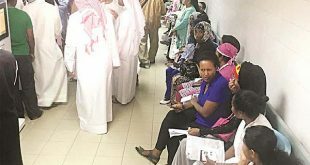 MP Safaa Al-Hashim has requested Minister of Health Dr Basel Al-Sabah to provide information on the amount collected from the health insurance for expatriates in the past two fiscal years – 2015/2016 and 2016/2017, reeports Al-Rai daily. Al-Hashim pointed out the explanatory document of law number 1/1999 concerning the health insurance for expatriate and imposing fees for health services stated that one of the most important objectives of this law is to provide financial resources for funding health care and for its development taking into consideration the high cost of such services. The MP also inquired whether the ministry has the authority to use the collected money. Meanwhile, MP Khalil Abul asked Deputy Prime Minister and State Minister for Cabinet Affairs Anas Al-Saleh about the decision to reduce the academic mark from ‘very good’ to ‘good’ for expatriates who are applying for the first time as doctors, pharmacists, allied health service workers and nurses. Abul requested the minister to provide him with a copy of the Civil Service Commission’s decision concerning amendments related to assessment of the professional expertise of non-Kuwaitis applying for the aforementioned positions and if a comprehensive study was carried out in this regard.